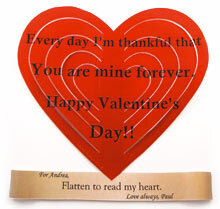 Show how much you flat out love your sweetheart with a personalized loving message hidden in a paper heart. 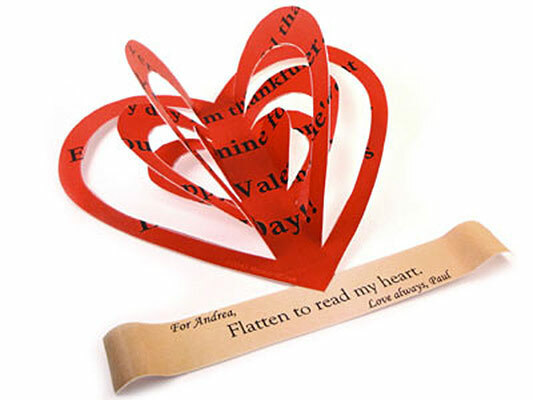 The heart is cut into raised rings that scramble the words until flattened. 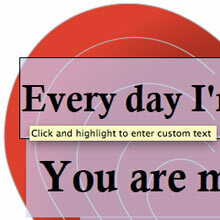 Fill in the PDF template form fields to personalize four lines of text on the heart and your names on the bottom. The text will automatically adjust to fit whatever you'd like to write. I flat out love you. Happy Valentine's Day! Every day I'm thankful that you are mine forever. Happy Valentine's Day! Only you could have healed my heart and put the pieces of it back together. Thank you for smoothing out the rough areas of my heart and loving me like I've never known before. 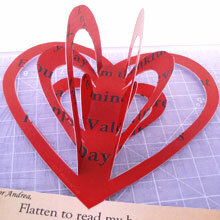 Share your heart creatively using something more memorable than another standard card. 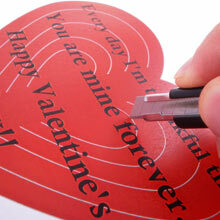 Personalize and print your own Flat Out Love paper craft heart using the simple instructions below. In Adobe Reader, select File, Print (click the From button to print page 2 only) and make sure Page Scaling is set to NONE. 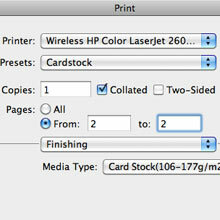 Select quality and paper settings to print on cardstock or heavy paper at best quality. 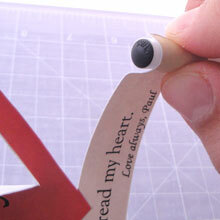 Using a craft knife, cut the smallest grey line ring of the heart first. 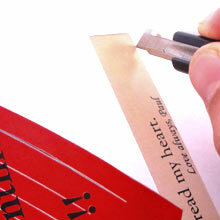 Turn the paper while cutting for a smooth curve. Repeat for the other lines and then the opposite side. 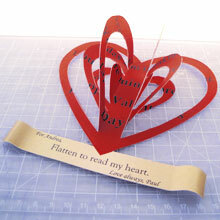 Cut along the outside of the heart and ribbon. Fold up the first center ring. Fold up the fourth ring to match the first ring. Fold the third ring up at lower angle than the first and fourth as shown. Repeat steps for the other side to match. Use the tip of a pen to curl the end of the ribbon as shown. Ready to present your beloved with a creative gift made by your own hands.